This is a great and rare story of persistence and ingenuity. Not all problems solved, but the family bands together and succeeds. Holly needs a winter coat but her family is poor and her father says she won’t be able to go to school when the weather gets cold because they can’t afford to buy a coat. Holly’s mom, Nellie, worries that Holly will miss too much school and says that maybe they can find some things in the woods for free and make money that way. Through strawberry, Juneberry, raspberry, blueberry, and blackberry season Holly and Nellie pick the various berries and make them into jams and jellies. The story also celebrates the relationship between Holly and her mom and the beautiful surroundings. After all the jams and jellies are made Holly’s father sets up a stand that he made and they sell their product to passersby. Come December Holly has a new coat and can go to school. This was a very sweet story. It not only shows the ingenuity of Holly’s mom but it also portrays the beauty of their surroundings in both the pictures and the language. I loved loved loved EVERY PAGE of this one! !I thought the girl could just go to homeschool, but you gotta have a winter coat. I have three.And she got it and it's so pretty, like her.The pictures all just made me feel like summer and I could look at them FOREVER.It was one of those books that Mama had to read to me, but sometimes those are the best ones too. All you have to do is sit there and look at the pictures and listen.And it was about summer but the end had snow. And the pretty girl in her pretty coat.So when we pick berries this summer, we don't have to be lazy and just eat them or put them on ice cream. We can make things with them and get MONEY!So it was an IDEA book, too.Wow. I loved this one!!! This book about a little girl helping her mom with picking fruit in the summer so that she will be able to go to school in the fall. Her mom doesn't want her to have holes in her learning like she does. When it gets closer to fall, they sell all the jam they made. At the end of the book, the little girl is able to attend school, and she reminisces on her summer picking fruits. I liked this book, I thought it was well written and beautiful pictures. I'm unsure how I could use it in a classroom setting, however, I would read it for entertainment. 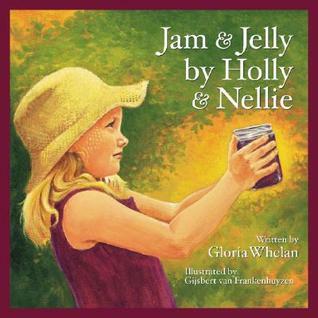 Best for kids ages 5 and up.Early Literacy Skills: Vocabulary, Narrative SkillsFrom cover: Holly's family lives a simple life in northern Michigan, enjoying the bounty of the earth and very much in step with the rhythm of the changing seasons. But times are hard and a cold winter is coming. Without a warm coat, Holly might not be able to start school. Readers will delight in Mam's solution to Holly's predicament.Sweet story and pretty illustrations keep this book moving. Great on relationship mother and daughter, plus father, and working for a goal. Wonderful sense of time and place, with illustrations that are a joy to look at. I loved how this went through the summer season and talked about berries. Excellent nostalgic feel to this book plus a feeling of connection with the land. Gloria Whelan Gijsbert van Frankenhuyzen - Gloria Whelan is the best-selling author of many novels for young readers, including Homeless Bird, winner of the National Book Award; Friutlands: Louisa May Alcott Made Perfect; Angel on the Square and its companion, The Impossible Journey; Once on this Island, winner of the Great Lakes Book Award; Farewell to the Island; and Return to the Island. She lives with her husband, Joseph, in the woods of northern Michigan.